Launched in February, One More Page is a fortnightly podcast for lovers of children’s books, hosted by Kate Simpson, Liz Ledden and Nat Amoore. 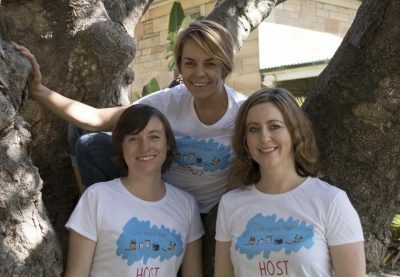 With seven episodes under their belt already, the team was shortlisted in the ‘Best Newcomer’ category for the 2018 Australian Podcast Awards. Guests have included author Tristan Bancks and Allen & Unwin children’s publisher Anna McFarlane and State Library Victoria family programs coordinator Bethany Macdonald. ‘We are a three-woman show. Between us we write scripts, organise guest interviews, record and edit episodes, source prizes, review books and design and manage the website and social media pages,’ says Amoore. She spoke to Books+Publishing for our ‘podcast spotlight’ series. One More Page is a fortnightly podcast for lovers of kids’ books. For anyone who reads, loves, borrows or buys kids’ books. It can be listened to by the whole family and includes book reviews, an interview with someone from the children’s book industry, plus competitions and a kids-led segment called Kids Capers. Our podcast is focused entirely on kids’ books. We don’t do grown-up books! From picture books to middle grade, we are dedicated to our niche market. We also pride ourselves on being a podcast for all ages. Something parents can listen to with their kids, teachers with their students and cat-ladies with their feline friends. All three of us are passionate kids’ book readers and writers who devour kid lit and love to chat about what’s new on the book scene. We met at a New South Wales Writers’ Centre (NSWWC) critique group dedicated to writing for kids. With a common passion for kids’ books, a blossoming friendship and a habit of over-committing ourselves, the next logical step was a podcast. It seemed like a great idea but putting it into practice was a huge learning curve. There were months of work in the set-up stage; everything from establishing a website and creating content, to setting up a podcast host and working out what equipment we needed. We also had to figure out everything from the name of the podcast and its format, to things like what music to use, and the look, feel and logo. Then in February 2018, One More Page was born! It’s amazing how well it has all worked out. Somehow between us, everything that needs to be done is covered and a great on-air dynamic has been created. Where and how is your podcast recorded? We record at the NSW Writers’ Centre using basic audio equipment that we purchased, and our trusty laptops. We interview our guests online using Zencastr and then distribute our podcast through our host Libsyn. A wonderfully talented friend of the pod came up with our animal characters and creates our banner images and episode logos (thanks Marianne!). Then we drag in friends and listeners and kids to participate in different segments. None of this would be possible without the amazing support of the children’s book industry who contribute Advance Reading Copies and prizes and suggestions. We are constantly surprised by the range of people who listen to our show. We have teachers who play our show in 10-minute segments in their class over the week. Writers, illustrators and publishers, parents and kids, a gorgeous little librarian fan club who we love to death, and then people you would just never expect. Oh that’s hard! It’s like picking your favourite child, right? All our guests have been amazing. On our first episode we had a group of kids from Waitara Primary School who reviewed Heidi McKinnon’s book I Just Ate My Friend (A&U) for Kids Capers. People loved them! Listen to the intro of episode two, ‘Get the Picture’, which focuses on children’s book illustration. Podcasts are where it’s at right now. We can only see it growing. And with a million dollars in podcast funding from the ABC recently announced, Australia is set to continue to produce more and more quality content in this space. The world is really starting to recognise it as an influential platform and it’s only getting more and more exciting. There are so many reasons to get your podcast on. It is like radio on-demand that you can stop and start as you please. There is a podcast out there for any subject you are interested in: from an in-depth study of the works of Tolkien to how you can prepare for a zombie apocalypse. In a world where we are go-go-go, you can listen and learn while you walk, run, shop, drive or sit on the bus. It allows you to be entertained without being in front of a screen. We don’t. We beg, borrow and steal. Okay, we don’t steal but we do ask a lot of favours. Most of the work is divided between us three hosts, and we have purchased some bare necessities like decent microphones. We’re also lucky enough to have the talented Marianne Khoo to do all the illustrations for us. Otherwise, we just chip in three ways when it comes to prize postage and getting promotional materials printed. But essentially our podcast runs on blood, sweat and tears. We are definitely interested in exploring funding options in the future but we also enjoy the autonomy that being independent gives us. At this stage we are happy to do the hard yards and we are not doing it to make a profit. However, we would definitely love to get a little bit of funding in the near future to help cover postage and explore better recording and editing options. We have been absolutely overwhelmed by the response towards the podcast so far. By the willingness of authors, illustrators, publishers and book industry professionals to not only participate, but to supply ARCs to review or prize packs to giveaway, and by our listeners from all walks of life. Our plan is to keep it up, and we are getting the encouragement to do so. It’s hard to believe we are almost three months into our first year. We have barely scratched the surface of the books we want to talk about and the people we want to interview. There’s plenty more fun to come. What other bookish podcasts should we be listening to, Australian or otherwise? Wow, there is a lot to choose from, so I think it’s only fair that each of us makes a suggestion. I recommend one of my all-time favourite podcasts, Story Pirates. It’s not particularly about books but it is about writing and literacy for kids and it’s just downright hilarious. Kate listens to FunKids Book Club, which could be described as the UK version of One More Page—all about the UK’s best kids’ books. Liz loves the Australian Writers’ Centre podcast, So You Want to be a Writer, hosted by Allison Tait and Valerie Khoo. To get upcoming interviews delivered straight to your inbox, and to stay up-to-date with Australian book industry news, sign up to our Weekly Book Newsletter. And to get full access to Books+Publishing’s features, news and interviews, purchase or renew your subscription.